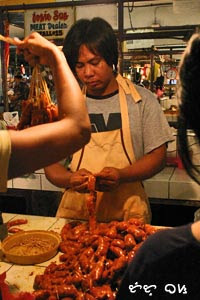 Longganisa, a Filipino version of sausage from a mixture of ground pork, spices, vinegar, and tons of garlic stuffed inside pig intestines as casing, and where every region of the Philippines has their own unique recipe and ingredients to give it a distinct taste. Pictures of longganiza at Alaminos market. Alaminos' version of the sausage uses toothpicks instead of tying the open ends or using a thread. "Those who love sausage and obey the law should not watch either being made," quote attributed to Otto von Bismarck, is so true. Tutubi, however, respects those making sausages for a decent living while resents those making the law who call themselves "honorable" men-- all they know is pork barrel! Back to longganisa topic, other notable variants are Vigan longganisa with their suka (vinegar), Pampanga-style (also the skinless ones), the oregano-laced Lucban, Quezon (available at Buddy's Restaurants in Makati), and the finger-sized ones from Guinobatan, Albay if you happen to visit Mayon Volcano, available at the Legazpi airport restaurant. Q: Where can we find the Philippines' best longganisa? However it's made I love Filipino longganisa over American, Italian, German or Mexican sausage. Ours have that vinegary, garlicky taste that I love. i agree with mari. sausage a la pinoy tops them all. kahit saang island pa galing. hands down. lucban longanisa isda best! i discovered recently that even cagayan has their own version. mala-lucban siya pero iba kulay at may slight difference. Well here in the States, the best longganisa can be found at Yen Chai's grocery store in Mt. Pleasant where it has been imported from the Philippines. We eat it once a week... at least, mostly pork but sometimes chicken longganisa. The Alaminos longgnisa sure looks tasty :) Is it true that in Pampanga they have a dogmeat version ? ( Bacolod and Iloilo) is one of the best tasting logganizas you can find in Pinas. hmmmm...looks good ginugutum na tuloy ako. i love it.....makes me want to go home and visit Alaminos.